On the 3rd of August, 2006 a three man Chilean delegation attended the FICCC meeting in Buenos Aires with the intent of clarifying their desire to maintain their unique breed identity and registry. Ever since 2002, the reincorporation of Chile to the FICCC has been a source of internal turmoil for Chilean breeders since the FICCC has demanded that Chilean breeders concede to utilizing the common name (Criollo) and common registry of all the FICCC members. For the past four years Chile has tried to be in good standing with the FICCC since they value the fraternal ties with their South American neighbors. Yet, the great majority of breeders clearly understand that the Chilean Horse is a separate breed of a much older and purer trajectory than the Criollo and that Chileans rightly should honor the legacy they have inherited from visionary founding fathers. The FICCC board members seem to have understood this as well, as in this meeting they suggested changing their by laws to include two types of members. One would be a "complete member" that shared the name and registry of the Criollo breed and the other would be the "adhered member" that although independent in name and registry could continue to participate in FICCC related events. This seemed like an ideal solution for Chile to be able maintain their individuality while maintaining the close ties they have had in the FICCC for nearly sixty years. Unfortunately, one of the Chilean delegates took it upon himself to give a long speech rejecting the classification of an "adherent member" while arguing that Chile had complied with all the requirements of the FICCC and he asked that Chile maintain its status as a "complete member" of the FICCC. 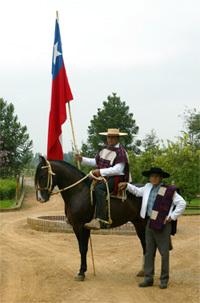 This personal rhetoric was contrary to what most Chilean Horse breeders would have desired to be the position of Chile going into this meeting, as accepting the status of complete membership once again sent out the message that Chile was willing to change the name of its national breed and participate in a common registry with the Criollos. Of course this is not at all the case, and as a result there will be one more year of a lack of transparency in Chile's relationship with the FICCC. Chile has walked the fence on this matter for too many years and it clearly has an obligation to its past of having the oldest stock horse registry in the Americas, the only closed stock horse registry in this hemisphere and by far the most consistent breed type of any stock horse breeds. This has all come about in a country of geographical isolation with its particular horse culture (huaso) that is unlike any other. Hopefully, in the next FICCC meeting these realities will be expressed by someone that truly is representing the best interests of the breed. It's no secret that the Chilean Horse has contributed greatly to the performance ability of the Brazilian Crioulo breed. Chilean Horse sires such a Hornero, Arrebol, and many more have left a lasting impact on the Freio de Ouro (Golden Bit) competitions in Brazil. In open NRHA reining competitions in Brazil Crioulos with strong Chilean Horse breeding have also overwhelmed the Quarter Horse competition (take note that Brazil has the second highest inventory of Quarter Horses in the world). A new bit if history took place in the 2006 NRHA Italian Derby. Tied for second place with a score of 222.5 in this prestigious event that attracts the best Quarter Horses of Europe, was the Brazilan Crioulo Joio do Infinito. This colt is by Consuelo do Infinito a stallion that in 1999 won the Brazilian Golden Bit competition and now stands in the Cabanha Infinito in Brazil. Consuelo do Infinito is by the Chilean Horse Santa Elba Señuelo and is out of a mare whose sire and dam are both by Chilean Horses. This fine breeding farm has excelled in performance horses in Brazil and one has to only look at their stallion roster to see how strongly they believe in Chilean Horse bloodlines.